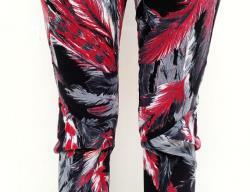 Stand out in a pair of gorgeously vibrant trousers with an eye-catching feather print and a flattering high waist, these slim fit pants add a touch of cool to a basic black or grey top. They have a side zip and a bit of stretch which makes them wonderfully comfortable and stylish. Every woman should have one pair of unique comfy pants in her closet, and these skinny pants could become your season's favorite pair them with a long sleeve top and ankle boots, or with an oversize sweater, heels and jewelry for lots of chic. The thing about these pants is that they're so flattering. The zip is on the side- so the front is flat: you can wear a top over them, without having bulging zips and buttons on your belly. I've designed these pants with a wide waist-band for a flat-belly look. Best of all, there's a pleat on the side of the knee, which makes your legs look great. 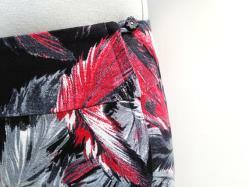 The print has a unique abstract feather design in red, light grey, black and white (see close up photo for details). The fabric is medium weight, made from 97% cotton with 3% lycra (for a bit of stretch and lots of comfort). Machine wash 30c (85f), inside out, hang to dry. To choose the right size, it's easiest to compare measurements with a pair of pants you already own and like. The lycra adds stretch, so please take into account that they will stretch slightly, this makes them more comfortable. If you are unsure between two sizes, i recommend to take the smaller size. I use a european size chart, so please look at the conversions to make sure you pick the right size. Photo 5 shows abc measurement guidelines. Eu 34 us - 2 uk - 6 au -6. (a: 68cm, b: 26.5cm, c: 71cm). Eu 36 us - 4 uk - 8 au -8. (a: 72cm / b: 27.5cm / c: 72cm). Eu 38 us - 6 uk - 10 au -10. (a: 76cm, b: 28.5cm, c: 73cm). Eu 40 us - 8 uk - 12 au -12. (a: 80cm, b: 29cm, c: 72cm). Eu 42 us - 10 uk - 14 au -14. (a: 84cm, b: 30.5cm, c: 73cm). Please feel free to contact me with any questions. 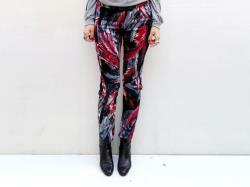 For more pants from my shop. For more items from my shop.